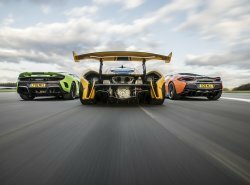 McLaren Automotive has been presented with the accolade of Manufacturer of Year in the 2016 BBC Top Gear Magazine Awards in recognition of the rapid growth and global success of the company, both achieved in so short a time. The announcement follows a ’vintage’ year for McLaren, its most successful to-date, with five new cars launched and another sales record achieved. McLaren also predicts 2015 will be its third consecutive year of profitability.